Right on schedule, we moved the broiler chicks out of the brooder house into their pasture pens on Good Friday, last week. The first night was cold, so we put down some wood shavings for bedding, but its warmed up nicely. They’ve been enjoying their daily moves to fresh pasture. We should have freshly frozen chicken at market, Memorial Day weekend. A new addition to market is our brown and blue eggs from our layer chickens. Many have remarked about the quality, flavor, and orange yolks. If you have any doubts about the benefits of pastured meat, eggs, or milk, the dramatic change in our eggs when the snow melts and the hens begin to forage for pasture and other critters would make you a believer! This is a guest post from longtime customer and friend, Jeremy. Jeremy is a professional landscaper, and amateur chef. I asked him to share his ham and bean soup recipe. Thank you, Jeremy! We will have plenty of ham available this Saturday at market. Nothing says home cooking like a good ham and bean soup. Ham, as with bacon, elevates practically anything it’s with into tasty territory. It’s versatile and works in many different ways; with pasta, casseroles, stuffed in cordon bleu, baked with vegetables, as breakfast, lunch, or dinner. And boy, ham is wonderful, especially from my farmer who raises happy, healthy, acorn fed hogs. I give him money and the occasional garden vegetables. I get his meat and eggs. I’m lucky to have him as a friend. 1. Sort and rinse beans. Soak overnight in cold water. Or if pressed for time, in a separate pot bring beans and water to a boil and then simmer for an hour or so while prepping above ingredients. 2. Trim excess fat off of ham, dice into small cubes and fry in soup pot. Stir and cook until fat is rendered and you are left with fried ham cracklings. Drain cracklings on paper towel and reserve. 3. Fry vegetables in rendered fat. Stir occasionally until onions and celery become translucent. 4. Add wine to vegetables to de-glaze pot. Boil off alcohol for a minute or two and add whole ham. Drain beans and add to pot with herb bouquet, pinch of pepper, salt, and stock. Add just enough water to submerge beans, vegetables and ham. Bring to a boil, cover and then simmer for 3-4 hours or until the beans are tender and the ham begins to fall apart. 5. Turn off heat, remove ham with bone, herb bouquet, and about half of the beans. Pull ham apart into pieces and strips reserving the beans and ham. Blend slightly cooled soup with immersion blender until creamy and smooth. Place reserved herbs, beans and ham bone back into pot and reheat, season with more salt and pepper if needed. The ham bone and herbs continue to add flavor as it reheats. 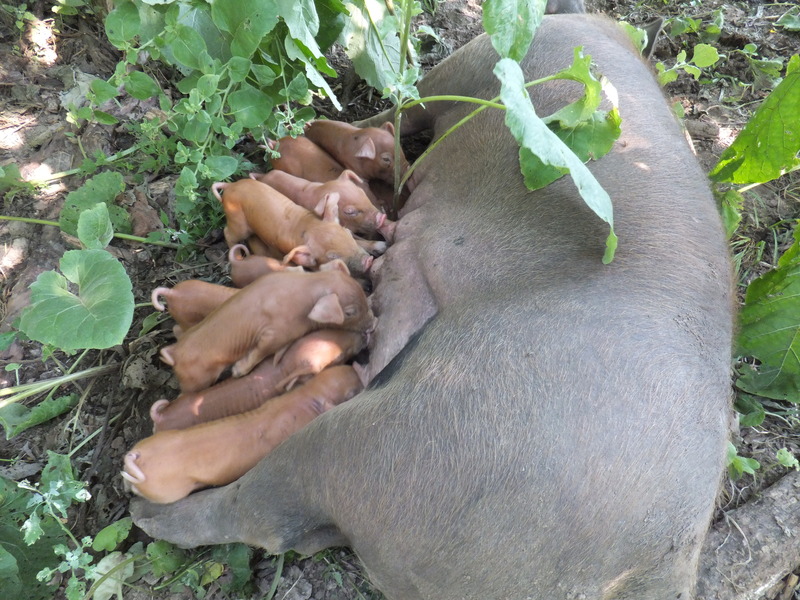 Duroc gilt in the woods with her litter of eleven piglets. Fourteen gilts farrowed this summer. It’s amazing how well they do in the warm months compared to the struggles I had last March. Most farrowed in a shelter, or I put a shelter over them after farrowing, as I let each choose her own spot to farrow. Two gilts were in a spot in the woods inaccessible to a shelter so I left them alone. They raised ten and eleven piglets each. I wouldn’t have had the courage to farm this way without reading other bloggers, specifically the granddaddy of farm bloggers, Walter Jeffries. Recently, he posted a photo showing a 300 lb, eight-month-old boar, raised on nothing but pasture and dairy products. Walter is a paradigm shifter for me. I’ve been without a computer for the past couple of months, hence my lack of posts, but I’ve kept up on the farm blogs I read and enjoy and wanted to share some more with you. Bruce King wrangles with government agents and speaks at government meetings. I love hearing about his civic adventures. He also purchased a confinement dairy farm recently and is transforming it to his vision. Andrew at Green Machine Farm writes about his new life as a farmer. He educated us on bat houses recently. Would you believe he made a bat house out of plywood, painted it black, and placed it on the south side of a shed? How anything could survive a midwestern summer in that box and not cook to death is beyond me, but Andrew informs us he already has bats living in it. Gordon Milligan is a train conductor in Chicago. He has a dream to farm and raise his own food when he retires. He and his wife recently purchased a farm in Iowa and are anxiously awaiting the day they will call it home. Lastly, I read a blog from a farmer in France. I like to see what Brent is doing with his farm because the soils and underlying limestone are extremely similar to my farm. 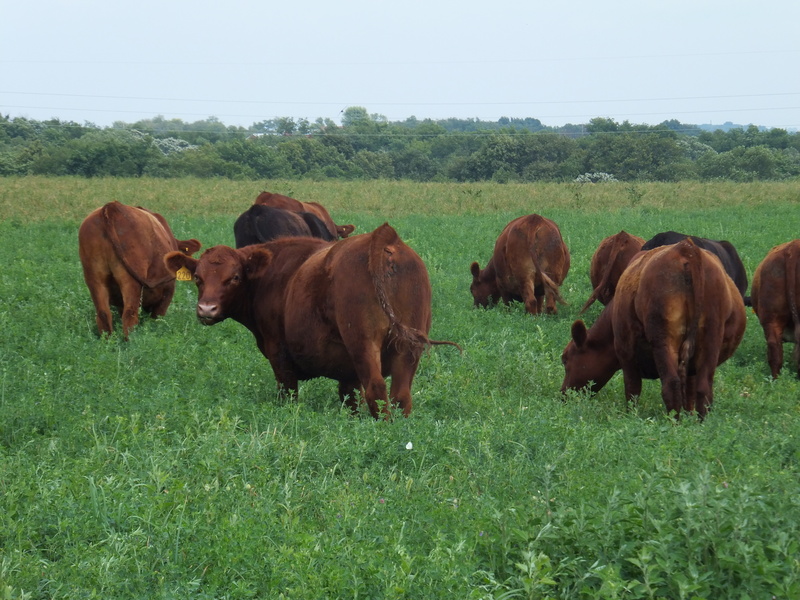 He grass-finishes Salers cattle, grazing alfalfa/orchard grass hay fields. Check out his blog and see if the photos of his land seem similar to mine, like in the photo below of my steers grazing a fresh hay field. “What is all the fuss about? Why are farmers protesting?” I thought as I sat and listened to Michael Pollan speak at the Dane County Farmer’s Market. After reviewing my notes I started to understand why he upsets some farmers. Michael Pollan is an excellent writer and speaker who can convincingly make a case for probably anything he feels strongly about. I thank him for caring about food and for pointing out a flawed system. I won’t be signing a petition to appoint him Ag Secretary though. Because, as even he admitted, policy is not his area of expertise, and I fear the wheels would come off if he were allowed to drive. I feel strongly about this because I see parallels between the American farm and food system and my own. My farm is transitioning from commodity-based livestock production to direct-market livestock production with minimal purchased inputs. We are not relying on an off-farm salary while we make this transition, so changes are made cautiously and evaluated every step of the way. Whatever the flaws of the American farmer and food system, we do feed a lot of people. And that is worth something. I’m intrigued by organic production, but fear I don’t have the time or patience to learn. I would love to help a young couple start an organic CSA on part of my farm. Then my curiosity would be filled as I reported on what they did. And they would have access to land to realize their dream to farm and feed people. But enough about me, let me tell you what Michael Pollan had to say. There is a movement rising to change the American food system. Nearly 8,000 people turned out for his speech on the UW campus. And there was evidence of pushback as protesters also were in attendance. Hard to argue with that. But then he connects the dots between the environmental crisis on one side and the health crisis on the other. Guess what he place in the middle as causative: Agriculture. Mr. Pollan said modern industrial agriculture drinks oil and spews greenhouse gas. He said agriculture used to use one calorie of fossil fuel to produce two calories of food. Modern agriculture uses ten calories of fossil fuel to produce one calorie of food. He said it takes 28 ounces of oil to produce one double quarter pounder at McDonald’s. I don’t know if that was with cheese. I have seen figures like this before and I question them. I will be writing a post this winter detailing how much oil my farm uses and how much food we produce because I’ve been curious about this. Mr. Pollan then says that energy comes from the sun and Photosynthesis is the only free lunch. He would like to wean the food system off of fossil fuels and put it back on sunshine. Food can be resolarized. The health care crisis is code for ‘cost of industrial food production.’ Since 1960, spending on health care has risen from 5% of GDP to 18% of GDP as the amount spent on food has decreased from 18% to 9.5% of discretionary income. I don’t buy into this simplified argument. Mr. Pollan says we still need to support farmers. We just need to change the subsidies to reward quality and diversity and environmental solutions instead of rewarding for quantity. I agree that government programs become ‘monsters’ that seek to sustain themselves rather than accomplish whatever it was designed to accomplish in the first place. I think we need results-based government programs. Mr. Pollan spoke about our food culture. “We need to reregionalize food. People need to learn to eat from a shorter food chain. He says the USDA is starting to get this and used the example of the new, ‘Know Your Farmer, Know Your Food’ program. Michelle Obama was applauded for her organic garden and for speaking out about the importance of growing and cooking real food. Claire Strader introduced Mr. Pollan, which was fitting because she is a Wisconsin grower that has become the White House gardener. Mr. Pollan doesn’t feel there is a lack of farmland. But there is a lack of farmers. We have been demeaning farmers for the last 100 years and that has resulted in a brain drain on the farm. That is something we both agree on. It is going to take major brainpower to continue to feed people in a sustainable way. I’m ok and no one was hurt, but I was in a traffic accident three hours ago. I was on my way to church in my truck and a minivan was pulled over on the wrong side of the road delivering a weekly shopping paper into a mailbox. I slowed down and moved into the other lane to go by them. As I came closer they pulled back onto the road right in front of me. I was going at least 40 mph and would have hit them head-on. I instinctively chose the ditch. I hit a culvert almost immediately and went airborne for 35 feet landing with the front end of my truck digging out the yard. I rolled to a stop and took off my seatbelt. My airbag didn’t activate. If I hadn’t been wearing my seatbelt I would have broke my neck in the cab or in the windshield. I know the guy whose front yard I ended up in. Dave happened to be looking out his window and saw the whole thing. He thought it was going to be a head-on and was amazed I avoided them. I would have seriously messed them up because I had all the momentum. They pulled off the road and walked to my truck. They were more shook-up than me, and I found myself consoling the woman who had been driving. We called the police and waited for them to come and fill out an accident report. It turns out her license had been suspended and she had been picked up for that before. She told me her eyes were blurry and she doesn’t see well. Her brother-in-law was riding with her. He didn’t have a license either. I could tell right away they were not healthy people. T’he police officer wouldn’t allow them to drive home, of course. She received a ticket for operating without a license and for operating on the wrong side of the road. And she couldn’t call her husband because the phone in their house was out. So Dave offered to pick me up in Argyle where they lived if I wanted to drive them home. So I found myself driving home the people who caused me to wreck my truck. If Idon’t laugh I’ll cry. All in all, I’m very happy and give thanks to God. No one was hurt. Be safe and drive defensively. A couple days later a cow gave birth to a calf that was premature and died. We walked the cow into the corral and placed her in the catch chute and helped Honey nurse the cow. The cow wanted a calf and after a couple of days she now claims Honey as her own. The cow is happy to have a calf and Honey is happy to have a mom. My niece returned home and would no longer be helping with chores, so we were happy to not have a bottle calf to take care of.